Citizenship (Amendment) Bill, 2016 : What to do now? (1) First Reading consists of the Introduction of a Bill. The Bill is introduced after adoption of a motion for leave to introduce a Bill in the Rajya Sabha. The Bill is introduced after adoption of a motion for leave to introduce a Bill in either of the House. At this stage, the Rajya Sabha can refer the Bill to the Parliamentary Standing Committees for examination and report within three months. It is at this stage that the Manipur State Government has to submit the desired Exclusion Clause to the Prime Minister, Home Minister with a request to get it examined by the Parliamentary Standing Committee of the Rajya Sabha. If the proposal for Exclusion Clause is sent to the Prime Minister, Home Minister with the State Assembly Resolution, it will carry more weight and there is greater chance of success. Even if the matter is not taken up by the Parliamentary Standing Committee, the blame will be shared with the Manipur State Legislative Assembly. The proposal Exclusion Clause should consists of full justification and shall be convincing to the Parliamentary Standing Committee. On receipt of the proposal, the Rajya Sabha will set up the Parliamentary Standing Committees and the Bill is referred to the Committees for examination and report within three months. (2a ) the 'first stage' consists of discussion on the principles of the Bill and its provisions generally on any of the motions: that the Bill be taken into consideration; that the Bill be referred to a Select Committee of the Rajya Sabha. (2b) the 'second stage' signifies the clause-by clause consideration of the Bill as introduced or as reported by the Select/Joint Committee. Amendments given by members to various clauses are moved at this stage. Manipur's indigenous population is hardly 0.20 % of India's population . What will happen to the indigenous population of Manipur if more than two lakhs of people from mainland India starts migrating to Manipur every year . This was what has happened from 1951 onwards till date. Naturally the indigenous Manipuris will become minority in our own state during the next 20-30 years. The Chief Minister may be in a position to convert the existing problems into opportunities. If carefully planned, we can bring love, understanding, harmony and unity among all ethnic groups and launch a collective struggle to achieve greater autonomy with a separate constitution drafted in consultation with all ethnic groups of Manipur. Piecemeal demand for ILP, Scheduled Tribe, lifting of AFSPA-1958 , amendment of Article-3 are only symptomatic treatment –not a cure. If the demand for greater autonomy is ignored by the Government of India, we can go for revival of the Manipur Constitution Act-1947. Presently, India is having two constitutions. Both the demands for greater autonomy and revival of the Manipur Constitution Act-1947 are technically, politically , constitutionally feasible provided we are united. Men united are invincible. To start with, the Chief Minister may kindly consider the following suggestions in the greater interest of the people of Manipur. 1. Calling a Manipur Legislative Assembly's Special Session- Taking a Resolution of the Manipur Legislative Assembly regarding the insertion of an "Exclusion Clause that the Citizenship (Amendment) Bll-2016 is not applicable to Manipur". This may be done before 30 January, 2019. 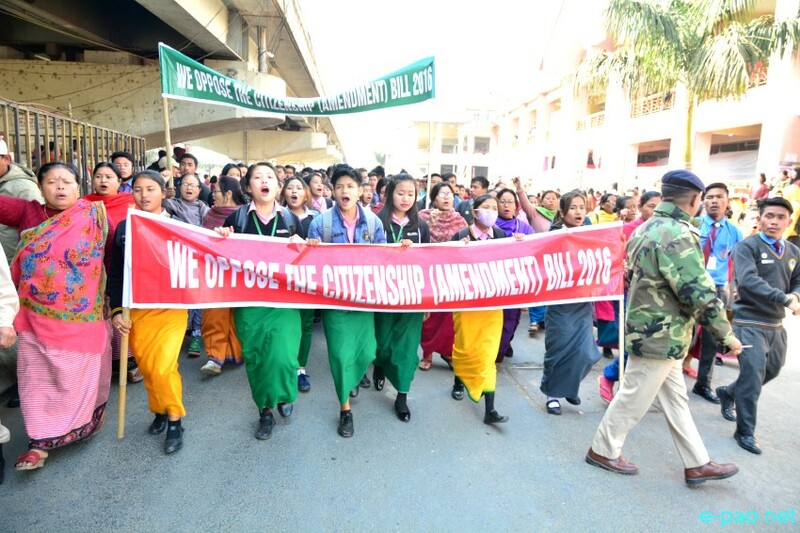 On 23 January, leaders of nine political parties submitted a memorandum to the Governor of Manipur, Dr. Najma Heptulla on the Citizenship Amendment Bill 2016 and urged her to direct the state government to summon a special session of Manipur Legislative Assembly to discuss the Bill while also asking for the central government and Parliament to withdraw the Bill. The Government of India may not honour the Assembly Resolution. But this will be a record which will be useful for future. Otherwise people may heap all the blames on the Chief Minister. If Assembly resolution is taken, people can not blame the CM even if the mission failed. 2. Meeting of the All Political Parties- The Chief Minister has already convened All Political Parties meeting on 28 Januuary-2019. The JD(U) has expressed their unhappiness and said that they will not join the All Political Parties meeting. Since this matter is crucial, the JD (U) may kindly re-consider their stand and participate in the meeting in greater interest of the people. The meeting is very important as they have to discuss important points like (1) withdrawal of the Bill from the Rajya Sabha or (2) simply requesting the Government of India to insert (a) an Exclusion Clause in the original Bill that this Bill does not cover Manipur (b) a para saying that the migrants should be settled only in their original homes in their original home states. If they are Bengalis, they should settle in West Bengal –not Assam or Manipur (3) to decide the date of calling Manipur Legislative Assembly session before the date of Rajya Sabha session,(30/01/2019). (4) Constitution of Manipur Population Commission. (5) possible withdrawal and redrafting of the Manipur People Bill-2018 (6) Effective Implementation of Foreigners Act-1946 in Manipur etc. The proposal for withdrawal of the Bill from the Rajya Sabha at this stage will be next to impossible. The proposal for insertion of an Exclusion Clause may be possible if we can influence the Prime Minister, Home Minister and the Rajya Sabha members to refer the matter to the Select Parliamentary Committee. The Congress President Rahul Gandhi, Sonia Gandhi, other MPs from the national political parties can help in the formation and recommendation of the Select Parliamentary Committee The Rajya Sabha session is from 30th January to 11 February, 2019. Whether the Manipur Politicians will be able to do this type of lobbying during such a short time is a big question. One Quick Fix method is –if all the 60 MLAs and MPs irrespective of parties including Chief Minister, Deputy Chief Ministers of the present and the past Manipur Government, Marry Kom, MP organise a sit in protest with complete coverage of National TV Channels , there is a chance for success. Mr. Arvind Kejriwal sat on Dharna while he was the Chief Minister of Delhi. The Delhi Students Union and the people of Manipur may join the Dharna. If the Manipur MLAs and Ministers want to do something positive, they may leave Imphal within a few days and start organising the strategy of the war. The people of Manipur may not like to see their faces in Manipur during the Rajya Sabha session. The Political Parties can issue a warning signal to the Central Government that if Rajya Sabha do not consider their demands, we may be compelled to launch a people movement to demand for Greater Autonomy of Manipur with our own constitution. 3. Formation of an All Political Parties Delegation with the CM as Chairman to lobby with the Prime Minister, Home Minister, BJP Leaders, National Leaders of other political parties. Lobbying with other political Parties will be very important. Other important parties are Indian National Congress (INC ), All India Trinamool Congress (AITC), All India Anna Dravida Munnetra Kazhagam (AIADMK) Samajwadi Party (SP ) ,Janata Dal (United) (JD(U) ) Telugu Desam Party (TDP), Telangana Rashtra Samithi (TRS ), Rashtriya Janata Dal (RJD) , Communist Party of India (Marxist) (CPI(M) ), Dravida Munnetra Kazhagam (DMK ), Bahujan Samaj Party (BSP ), Nationalist Congress Party (NCP), North East India Development Party , MPP etc. All prominent members of all political parties will be included. 4. Lobbying with National Leaders-The leaders of other parties except BJP may contact and hand over the write up to their respective National Leaders. For example, the leaders of Manipur Congress may meet Rahul Gandhi, Sonia Gandhi and all the Congress MPs of Rajya Sabha. Let us not blame the present Manipur MPs. They are innocent. They may not be having advocacy skills, We should help them and strengthen their hands. The Forum may assert that if the legitimate demands of Manipur is ignored by the Government of India, we are going to launch a peoples movement for demand of Greater Autonomy within India but with our own Constitution. The Indian Constitution is found to be not appropriate for a small state of Manipur. If the demand for Greater Autonomy is also ignored, then we will work for revival of the Manipur State Constitution Act-1947. What we require today is unity among us, among all ethnic groups, among Nagas, Meiteis, Kukis, Meitei Pangans, among civil societies of hills and valley, among insurgent groups etc. We should have heart to heart dialogue. There is no need of unification of all institutions. We should have common understanding, common language, common objectives, common strategy and common goals. The destiny of Manipur is to be decided by us –not by outsiders. United we stand, divided we fall. 6. We should also explore the legal option as suggested by Narengbam Samarjit Singh, Director, Salai Holdings Pvt.Ltd. and President of the North East India Development Party. There are some points which are considered unconstitutional in the Citizenship (Amendment) Bill (CAB), 2016. We may directly approach the Supreme Court of India for doing justice. This article was webcasted on February 08 2019.